A bear cub and a boy live together. But then the bear cub grew up to be a rather large bear. In order to still be a bear and do “bearish” things, the boy and the bear realized that the bear would need to move. 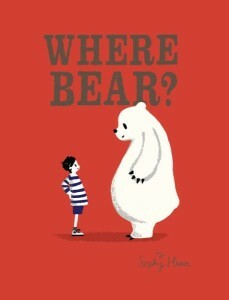 But the question is “where bear?” Not in a toy shop. Not in a zoo. Not in a circus. The bear and the boy look all over for the perfect place for bear to live. One of my favorite things about this book is the illustrations. On the page with the cave and the trees the cave has a plethora of different grey textures and the trees have a dominant black trunk that shoots straight up with black branches highlighting the green cone-shaped conifer trees. Yet…on the jungle page there are so many different tangles of vines and leaves in various shades of green to make the scene seem as tangled as a jungle. These illustrations are full of textures and are just fun to keep looking at.